I’ve been really inspired lately by flavors. I think I’m starting to find my own style when it comes to putting flavors together, and the results in the kitchen have been exciting as ever! I think it might be the looming change in season or something, but right now I am really fueled up to create new dishes…and I can’t wait to share everything I’ve been cooking with you! 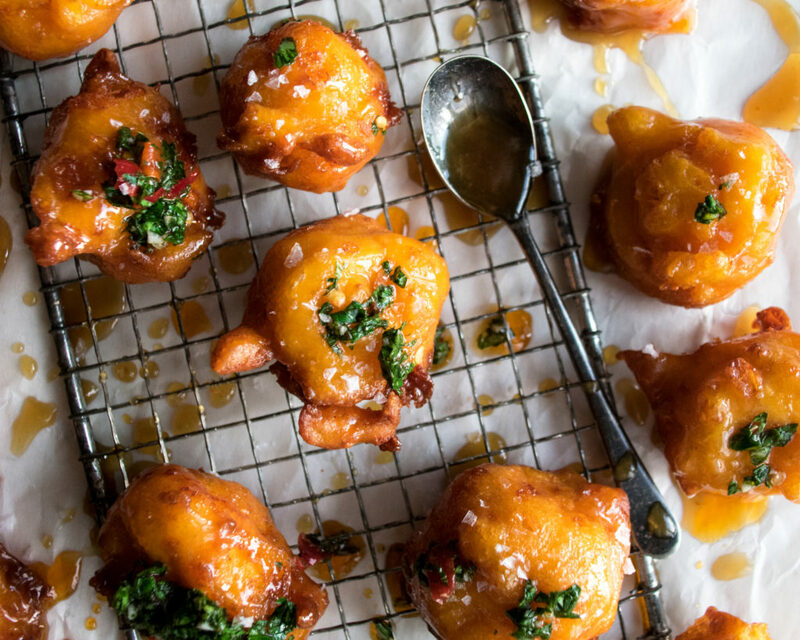 One of the recipes I’m really excited about right now is this one: sweet potato fritters! I tested these a couple of times to get the texture and consistency of the fritter just right, and I think I finally got it. Crispy exterior, soft and airy interior, with just the right amount of melted cheese *almost* oozing out. The sweet potato flavor is subtle, but enough to call for a honey butter glaze to pull out some of that sweetness even more. Oh the glaze is so good. It’s extremely quick, coming together just by bringing the honey to a simmer with a splash of water and then whisking in some butter until smooth and silky. The key to the glaze I realized is adding some salt. 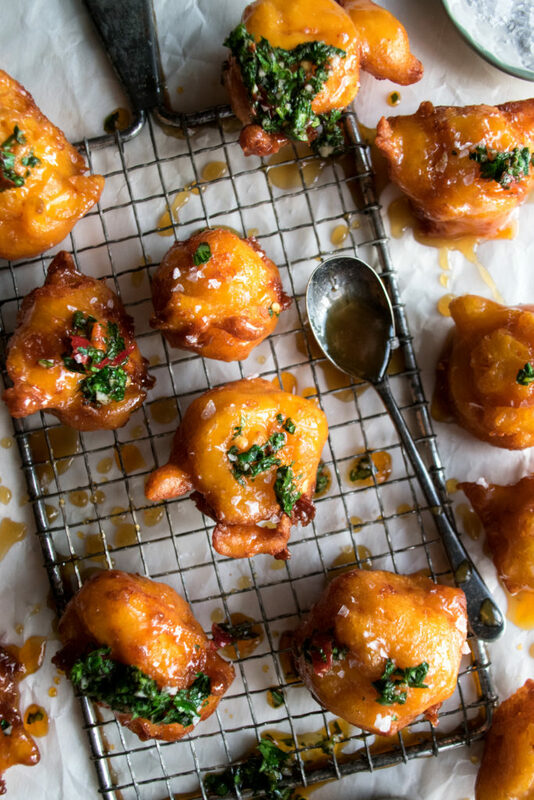 It pulls out the honey in a sweet and salty way that completely enhances the fritters once they’re coated. And then there’s the calabrian chile chimichurri. I actually had chimichurri on hand after using it as a topping for a creamy spiced cauliflower soup (recipe coming soon). I added a few teaspoons of calabrian chiles out of the jar I’ve had in my fridge forever. I figured the spicy chiles, tangy herb-packed sauce, and rich honey glaze would be the PERFECT combination. And it definitely was. The chimichurri adds a few extra ingredients to your grocery list for this recipe, so you can absolutely omit it if you’d like. But, on the other hand, it’s never a bad idea to have some chimichurri around for different meals throughout the week (top seared meats with it, use it on soups, drizzled on eggs, etc.)! I hope you enjoy. And keep tagging me on Instagram if you make any recipe from the blog. I really love seeing what you’ve been cooking! Preheat the oven to 375°F. Use a fork to prick the sweet potatoes all over on all sides. Place the sweet potatoes onto a sheet pan. Roast them for about 1 hour and 15 minutes until completely tender. Whisk together the flour, baking powder, baking soda, and kosher salt. Fold in the shredded gouda cheese until even dispersed. Set aside. When the sweet potatoes are done, remove them from the oven and let them cool. Fill a heavy-bottom pot (or Dutch oven) with enough oil to fill about half way up. Heat the oil over medium heat until it reaches 350°F. Once cooled, use your hands to peel off and discard the sweet potato skins. Weigh the flesh into a mixing bowl. You want a total of 10 ounces. Mash the potatoes with a fork. Whisk in the eggs and milk until smooth. Pour the wet ingredients into the dry and use a wooden spoon or rubber spatula to fold everything together until just incorporated. A note on the oil: once the oil reaches temperature, continually check it (lowering or raising if needed) to maintain it while frying. Oil that is too cold won’t crisp the batter, and oil that is too hot will create a tough, dark exterior before fully cooking the inside. 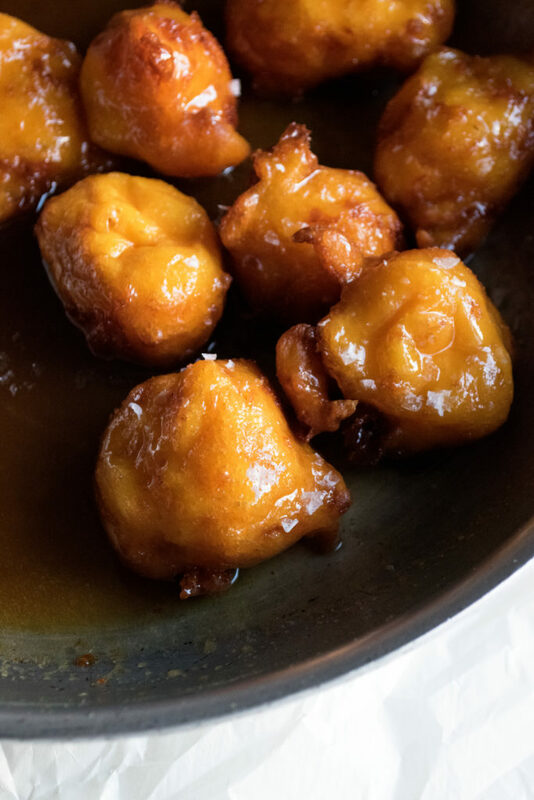 Use two spoons to scoop out the batter in small, bite-size balls and drop them right into the hot oil. The motion I like to do is spooning the batter with one hand and then using the other to slide the batter off the spoon into the oil. Work in batches and don’t overcrowd the pot. Fry the fritters until golden brown on one side. Use a fork to flip each fritter over and continue cooking on the other side. Use a strainer to transfer the fritters to a sheet pan lined with paper towels. Meanwhile, combine the honey, water, and salt in a medium sauté pan. Bring to a simmer over medium heat. Simmer for 30 seconds, lower the heat and whisk in the butter, one tablespoon at a time, until smooth and silky. 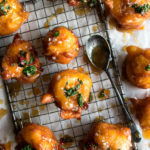 Start serving the fritters immediately as you continue frying the rest of the batter (they are the best when extremely fresh). To serve, quickly toss the fritters in the glaze, transfer them to a platter, and serve with the chimichurri over top. You can also serve the fritters plain on a platter with the glaze and chimichurri on the side for everyone to drizzle themselves. Stir in the extra virgin olive oil, red wine vinegar, and calabrian chiles. Season with a pinch of salt. Taste the chimichurri and add more chiles or salt if desired.